Balsamic vinegar has a tangy, sweet flavor with an intense aroma. This versatile and beautiful vinegar also punches up the flavor of dairy based fats, so if you're going to use it to drizzle over a salad, be sure to include full fat blue cheese or a fresh mozzarella. What is the best balsamic vinegar? It depends on who’s consuming it and what you intend to use it for. In this guide we have chosen 10 balsamic vinegar brands that we consider to be top of the line for beginners and for those with a sensitive palette and larger budget. This balsamic vinegar is aged for ten years in oak barrels, resulting in hearty, thick vinegar with a consistent flavor. Trader Joe's balsamic vinegar is a good combination of aging and consistency. Because it's kept only in oak barrels, you can be certain that the next bottle will have a similar flavor and odor. ​It's also important to consider the palate of your fellow diners. For those who love the intense aroma and tang of balsamic vinegar, the Trader Joe's may taste a bit flat when compared to vinegars steeped in a variety of wood. Vinegar beginners will appreciate Trader Joe's consistency and fairly easy access. The cost of Trader Joe's ten year old vinegars is certainly fair, and for a consistent and reliable product with a major brand name behind it, a bottle of this may be a good investment. A bottle of balsamic vinegar can be stored for up to five years either in the cupboard or the refrigerator; it's simply a question of where you use the product. For salad dressings, keep it cold. For glazes and soup finishes, keep it in the cupboard. Traditional production techniques for balsamic vinegar include transferring it to smaller barrels made of different woods to infuse complex flavors into the vinegar. This may result in a unique and delicious vinegar; however, it may also be a process that's difficult to replicate. Colavita balsamic vinegar is an older product that is moved from barrel to barrel to increase flavor intensity and reduce water in the product. This is a thick, heavily flavored vinegar. It doesn't take much of this product to add a delicious tang of sweetness to any product, whether savory or sweet. Many fans of inventive cooking strongly recommend not heating this vinegar, but using it cold or at room temperature on top of cold dishes, including strawberries, cheeses or sweet dairy products such as ice cream. 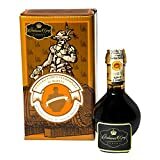 Heating balsamic takes the pungent edge off the product, and this is the truly unique quality of aged balsamics that you want to keep, so keep this product cool and use it on chilled or room temperature plates. Be aware that one of the barrel materials used to age this and other aged balsamics may be juniper. Some diners find vinegars aged in juniper wood to have a sharp, bitter flavor and find it very unpleasant. Be prepared to set a few strawberries back for diners who can't tolerate the flavor contributed by juniper barrels. However, if you love balsamic vinegars and are ready to expand your palate by investing in a more luxurious product, the Colavita balsamic vinegar may be a great choice. When studying balsamic vinegar reviews, be aware that not all palates are ready for this product. There aren't many middle of the road views on aged balsamic. The MiaBella balsamic vinegar option is a great choice for adventurous cooks. This vinegar is aged up to 18 years; maybe more, and maybe less. You may get vinegar that spent several years in oak barrels and only a few years in juniper wood barrels, so each bottle may well have a slightly different flavor. 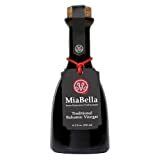 The MiaBella balsamic vinegar product description encourages cooks to use this balsamic vinegar both in cold applications and hot. It's important to note that balsamic vinegars are a great addition to meat marinades, and as previously stated, balsamic vinegar really punches up the fat content in any food. MiaBella is produced in small batches and has no added sugars. It's a great base for balsamic glazes and reductions. Per food expert The Pioneer Woman, a balsamic glaze is quite easy to make. However, once the sugar has been added and the vinegar has been reduced, the long term storage luxury of balsamic vinegar disappears. Be certain to store your glaze in an airtight container, and use it up within two weeks. One of the common descriptions for Roland balsamic vinegar is sweet. If you've had balsamic vinegar in the past and simply can't get past the burn that can occur at the first sniff, this may be the vinegar for you! Curiously enough, Roland doesn't give out much data on the aging process or time on their website. However, they offer a wide variety of balsamic vinegars in containers from small bottles to restaurant-sized jugs, so the versatility of their products is quite obvious. The Roland Diamond balsamic would be an ideal choice for a cook who's enjoyed savory balsamic cooking and is ready to try the sweet. This is a vinegar that would make a great glaze or reduction. Suggestions for your balsamic glaze include mild cheeses, fresh ice cream, or strawberries. Keep your glaze or balsamic syrup refrigerated and use it up quickly! Bertolli is a good quality, basic grocery store balsamic that you can keep in the cupboard for a finishing splash in a soup or as a marinade. This product is only aged for months, not years, so you can expect the flavor to be fairly mild and the product to be watery. However, this is not necessarily a negative. There are many food products that simply don't tolerate strong vinegar. In addition, the water in this product may make it possible to create a dressing or marinade that is light both in flavor and in color. Heavy balsamic vinegar can lead to unpleasant discoloration of the meat. The Bertolli balsamic vinegar can be stretched and still give a flavor bump. Of the balsamic vinegar brands available at your local grocery, this is a good investment. You'll get consistent flavor from bottle to bottle and can count on it to behave consistently in your recipes. Will it set the world on fire at your balsamic vinegar tasting? Probably not. Will it make a tangy salad dressing? Absolutely. 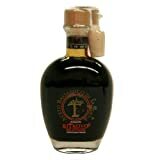 This 25 year old balsamic vinegar offers a true Italian balsamic, grown, pressed and aged in the original style. This traditional balsamic is DOP certified and approved and certified by the Consortium of Traditional Balsamic Vinegar in Modena, Italy. Be aware that this product will not come from only one producer; the Consortium places its seal of approval on the very best aged balsamic vinegar produced in Modena. While you may note that the vinegar is sourced from different areas depending on the year it's bottled, you'll know that each bottle is of the highest quality. The Ritrovo is a 6 year old vinegar with plenty of flexibility and flavor depth. This product is quite thick; pour with care, particularly if you're dressing salads directly from the bottle. The liquid is robust enough to make balsamic reduction unnecessary. You won't need to reduce this balsamic; the aging process has done that for you! This 250 ml / 8.5 ounce bottle is loaded with sweet, rich flavor. Use it as a brushed glaze on grilled meat or as a simple dressing over fruits, salads or cheese. If you plan to send this as a gift, have it shipped to yourself and confirm the packaging to avoid potentially finding the receipt was included in their drop-shipped gift. At only 2.39 ounces, the Mussini 100 year vinegar can best be classed as liquid gold. This vinegar offers a thick, hearty dose of intense flavor in every teaspoon. Most users do not recommend it for salads; the flavor is too intense to use just on greens. Instead, use this lush treat in combination with quality cheeses or nuts. The best balsamic grapes come from wine-producing regions, so try some California balsamic from Willow Lake Farms! This product is made of a reduction of red wine must, red wine vinegar and caramel coloring. While the flavor is quite popular with many customers, it should be noted that the majority of the reduction comes from cooking, not from time in barrels. That being said, this vinegar is a great product to have in the cupboard. If you like a thick reduced balsamic, try making your own glaze. Avoid adding sugar during your first reduction to build flavor intensity; it may result in an over-sweet glaze. White balsamic vinegars keep their light color thanks to the addition of white wine vinegar in the initial reduction process. In addition, white vinegars are often aged in stainless steel containers, rather than barrels. If you're looking for the rich flavor of an aged balsamic, you may be disappointed in the Colavita White Balsamic. However, a white balsamic is a great option when you're looking for something a bit simpler, such as for savory salad dressings or to brighten a fruit dip or dressing. This product is easy to reduce or turn into a glaze and the price leaves you space to experiment with flavoring or sugar additions. Balsamic vinegar is made from the pressings of sweet white grapes. After pressing, the liquid is reduced via boiling to caramelize the sugar. It is aged, but not fermented, in a series of barrels that each imparts their own unique flavor into the liquid. Over time, balsamic vinegar develops a lush, complex flavor that works well on most any food as a sauce, marinade or dressing. Whether you're buying white balsamic vinegar, which is reduced with a small percentage of white wine vinegar to keep it pale. If at all possible, purchase your balsamic vinegar as aged as you can find or afford. Don't fiddle with it too much. If you have access to good balsamic, use it as it is with as little seasoning as possible. Age matters; as possible, buy aged balsamic. True balsamic vinegar was developed and is produced in Italy. Even a small bottle of Italian balsamic is a great investment. While white and wine vinegars are known for a sharp sour flavor thanks to their alcohol base, balsamic vinegars are made from a base of must or the pressings of white grapes. This sweet juice is boiled down to a syrup and aged in wooden kegs; some balsamic vinegars go through multiple aging steps and gain flavor from the next keg as the vinegar is transferred and left to evaporate and thicken. Balsamic vinegar can run the gamut from thick and sweet to watery with a strong bite of flavor. Depending on the age of the vinegar and the variety of kegs it's been aged in, the many types of balsamic vinegar can have their own unique flavor. Dark balsamic vinegars can have a rich hint of caramel, and white balsamic vinegars maintain a lot of the sweetness of grape juice. Rating: 8 out of 10. Dark balsamics are not sour; but white balsamics have some white vinegar added during the cooking process. Rating: 3 out of 10. Neither balsamic is sour, but they will draw out the flavor intensities of other foods; for example, a balsamic vinaigrette combined with blue cheese will boost the intense salty flavor of the cheese. Rating: 5 out of 10. Dark balsamics are caramelized and may have a bit of bitterness at the back. Rating: 1 out of 10. There is an intense aroma and flavor combination found in dark balsamic vinegar that is almost impossible to define, but a good balsamic can hit your palate like horseradish or wasabi. Rating: 8 out of 10. Balsamic vinegar is an easy, low calorie way to add a lot of interesting flavor to simple salads and sauces. It's extremely low in sodium and calories for the intensity it adds to your meals. Does balsamic vinegar have sugar? Yes, from the grape pressings. Vinegars in general can help lower blood pressure, taking stress off of both your circulatory system and your heart. Balsamic vinegar originated in Italy and has been part of a heart healthy diet for generations. On its own, a good balsamic has a rich and intense flavor array; any additional spices you add may just dampen the complex flavor found in your vinegar. Pair it with good olive oil for a salad dressing, and then let your vinaigrette act on other ingredients in the salad, such as cheeses, nuts and meat-based proteins. One of the main balsamic vinegar benefits is that it boosts the flavor of other foods, lowering your need to add more sodium. Finally, balsamic vinegar has a low glycemic index, unlike other foods that have been reduced to syrup. The sugars in balsamic are naturally occurring and balsamic vinegar is only reduced by cooking in the first step; after that, balsamic is reduced through evaporation. For vegan diners, it's important to confirm that your balsamic has been reduced via evaporation and time. Some balsamic vinegars are reduced and thickened not over time but with the addition of gelatin. Check your label and the age of your vinegar; reduction takes time. While this product is traditionally vegan, check your balsamic vinegar ingredients. If your vinegar is a syrup, it may have had thickener added. Balsamic vinegar straight out of the bottle is a hearty marinade on its own. If you really enjoy the taste of balsamic, you can intensify this complex condiment by reducing it over high heat. This boils off additional liquid and leaves you with lush syrupy balsamic vinegar. To make a balsamic reduction, we recommend starting with a good, aged balsamic. Put one cup vinegar into a small saucepan and turn the heat to medium. Never walk away from boiling balsamic; it can burn quickly. Stir occasionally as the balsamic reduces; once it coats the back of the spoon in an even layer, it's done. When cooking with balsamic vinegar, remember; it's based on fruit juice. That sugar caramelizes easily and thus burns easily. Don't leave this pot unattended! Balsamic vinaigrette can be made with only two ingredients: balsamic vinegar and olive oil. The standard ration is three parts oil to one part vinegar, but you can change things up to reduce fat and increase flavor intensity with more vinegar. For a tangier dressing, add Dijon mustard or shallots; if you need something sweeter, add dark brown sugar. Drizzle balsamic vinegar over any salad containing tomatoes, such as a caprese salad. The tang of the vinegar will bring out the sweet, fruity flavor of the tomato flesh. Any citrus fruit can be brightened with a touch of balsamic; strawberries and watermelon can especially hold their own next to balsamic. Once you find a vinegar you like, balsamic vinegar uses will occur to you every time you cook! The sugar in balsamic vinegar makes it an excellent marinade for any meat you plan to grill or fry. Land O' Lakes offers a savory marinade loaded with fresh herbs that will work with any flesh. Again, don't fiddle with it too much. Balsamic recipes can rely on the flavor depth of the main ingredient. A balsamic reduction will possess a rich, sweet flavor. This unique taste can be used as a drizzle for ice cream or as a dip for rich, yeasty bread. Can you buy balsamic reduction? As a general rule, this is referred to as a balsamic glaze, which may or may not have thickeners added to it. Balsamic reductions are quick and easy to prepare, but if you find a glaze that offers great flavor, use it! In a pinch, we would consider Roland Foods balsamic glaze. You can make your own balsamic glaze with 2 cups balsamic vinegar, 1/2 cup of sugar, a pinch of salt and a saucepan. Simply boil down the mixture until it's reduced by half. Don't leave this unattended! The sugars will caramelize beautifully, but the next step is scorching. It only takes 30 minutes. Once your glaze is cool, store it in the refrigerator for up to two weeks. Once you have a bottle of balsamic vinegar in the cupboard, you can find plenty of ways to use this rich flavor. If you don't have any but find a recipe that calls for it, try combining one tablespoon of cider or wine vinegar with 1/2 a teaspoon of sugar as a viable balsamic vinegar alternative. Balsamic vinegar is one of those foods that can't be substituted. If you enjoy it, you'll find many uses for this delicious product. Balsamic is a great flavor combination with acidic fruits, including tomatoes and strawberries. While American cooks commonly use quality balsamic vinegar in savory dishes, it can be reduced to great effect over sweet foods, such as ice cream. Of the vinegars featured, we think the best supermarket balsamic vinegar is Trader Joe's balsamic vinegar. This vinegar is well-aged, kept in oak for consistent flavor, and affordable. On the high end, Mussini 100 Year Balsamic Vinegar would be an exquisite choice for those looking for a much deeper and complex tasting experience. Stop at a farmer's market for some late summer tomatoes, treat yourself to some fresh mozzarella, and enjoy! Did you enjoy this guide? Let us know in the comments with your favorite balsamic vinegar brand, recipes and anything you thought we missed. If you're a first time buyer, what questions do you have about this fabulous ingredient?